Print is far from dead, but digital is definitely here to stay. My eBook (inluding my RPG library) collection surpassed my physical collection more than a couple of years ago and its size has continued to grow exponentially. I spent a lot of time organizing, maintaining, and converting books in my library, which could be a hassle until I found Calibre. Calibre is the most feature rich eBook management tool I’ve seen. Calibre can also be extended via plugins or by improving the source, which is open. Most of the following can be found on the Calibre site, but I’m so thrilled by the software I’ll repeat the features here. It manages your library from the concept of a logical book, which means it will only have one entry per book regardless of how many formats I have it in, which keeps the interface clean and concise. It can also sort on all the metadata you’d expect: title, author, date added to library, date published, size, rating, series, etc. It even stores covers. Calibre will even go online and download metadata for the book based on title/author or ISBN. It also supports custom metadata via tags, which is especially great for RPG libraries. You can tag with system, version, setting, or as a third party publication. This makes finding all the relevant resources for your game a snap. I used to organize my library by publisher, but then I’d find myself needing to access lots of directories to get all the material I needed. You may also attach comments about the book. Calibre supports a large number of devices natively, but it be used with any eReader that exports itself as a USB disk. The following is a list of just a few of the devices supported: Android devices, Edge, iPad/iPhone, Kindle, Kobo, Nook, and Sony PRS. 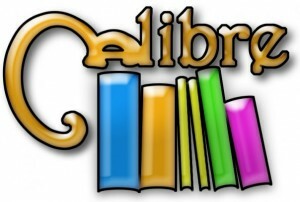 Calibre can also be used to read your library and its viewer supports a wide array of formats. It also supports bookmarks, table of content, CSS, printing, and searching. You may also customize the experience by adjusting a user style sheet and fonts. Of particular note to bloggers and blog readers is Calibre’s ability to automatically fetch feeds and convert articles into an eBook format. It supports about 300 news sites out of the box, but users can build recipes for new sites and upload them to the Calibre forum. My favorite feature of the Calibre program is its ability to serve my books so I can access them from anywhere. This feature is particularly useful for those of us with mobile devices that don’t have a lot onboard storage. You can actually browse your collection from anywhere with an internet connection with a simple browser (like on your smartphone or even with the Kindle). Hell, this ability is even useful when running a game at home as it allows me to keep all my eBooks in one location but access them from multiple devices at the table. Calibre gets my highest recommendation 5 out 5 flasks! Of course my favorite part of Calibre is that the software runs on Windows, Linux, and Mac. There are even portable versions for USB Sticks. Yeah, I failed to mention it’s cross-platform. Have you tried converting your PDFs to another format such as Kindle or Epub for use on your E-Reader? I know that a lot of issues are due to tables and layout. Just wondering. I tend to access my library remotely via a netbook, so I haven’t bothered converting many RPG PDFs. I have done it to see about reading them from my smartphone, and there are issues with tables & images. I think it’s more of a limitation of epub format than any converters out there. That’s what I was thinking I have a Android Tablet, and can do PDFs but the Epub formats display faster and more consistently. (Huge Grahics don’t work well especially backgrounds). So, theoretically, I could do a daily digest of RPGBA to ebook form, but I’d need to code the feed conversion first? Am I understanding that correctly? Very handy, but possibly more than I want to tackle just now. I definitely think I want to look into this. The multiple DTRPG relief bundles have left me with a staggering number of PDFs to manage. Lugh, that is correct. The codes are called recipes, and there are tons of examples. They didn’t seem too intensive too me, but I have yet to create one and I’m also a programmer by trade (so, I may be biased).